Custom Fields allow you to add data to your contact beyond the standard data that can be captured (name, telephone number etc) that matches your business processes. This data can be added in various formats, such as standard text fields, dates and drop down lists. This guide will take you through the steps required to add custom fields to your contacts. From the main area select the ’company configuration’ tab from the top of the screen and select ‘Custom Fields Configuration’ from the left hand menu. Selecting this will open the following screen which will show an empty custom field list until they have been configured and added. 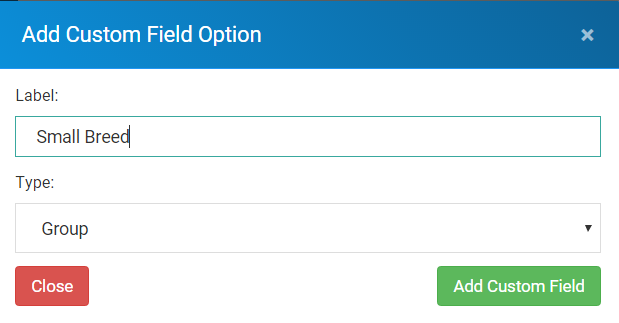 Select ‘Add new custom field’ and the following window will appear. 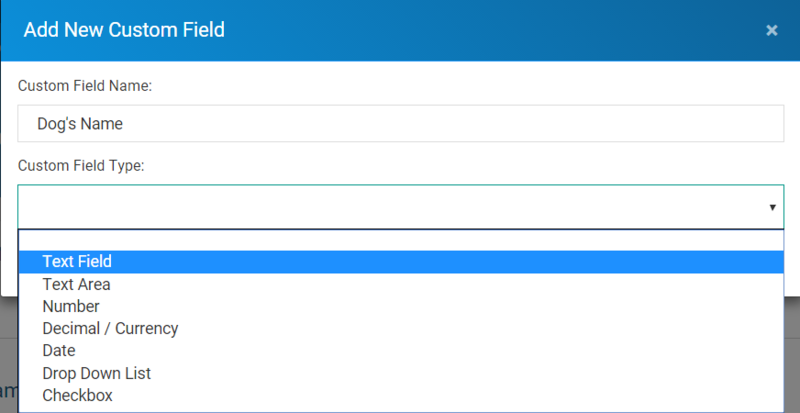 From here you are able to give the custom field a name a define which type of field it is. Text Field: A simple field in which such text as a name can be added. Text Area: Allows for more text to be added, such a specific requirements. Number: A simple number field. Decimal/Currency: e.g. Hourly Rate (GBP) for field name. Date: A standard date picker via a calendar. Drop Down List: A list of multiple options that can be categorised into groups. Checkbox: A simple yes/no type confirmation. Once you have created the custom field name and type it will be displayed in the custom field list as below. From this list you are able to create a new Custom Field or edit an existing one by selecting it from the menu. 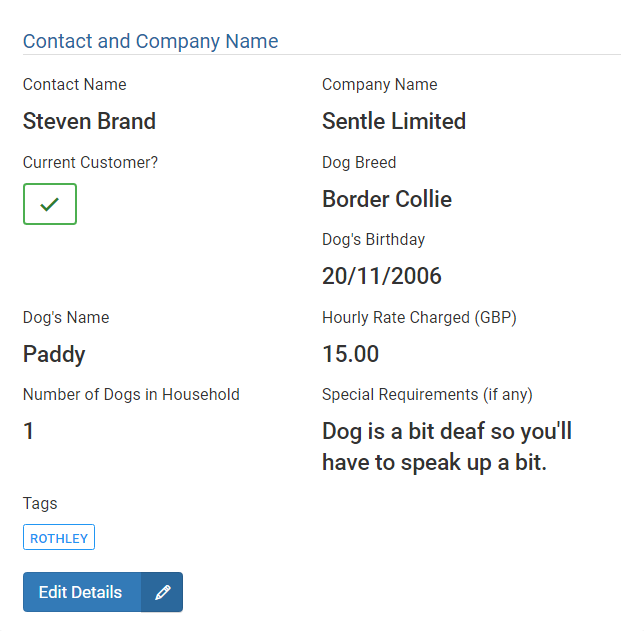 The image below shows the details of the ‘Dog’s Name’ Text Field. 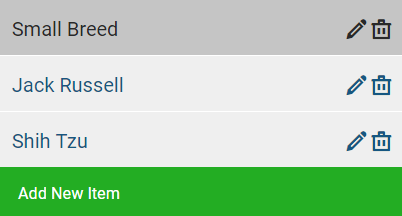 Field can be found with quick search? Enable if you want to be able to search for contacts based on the data that is added into this field. Field is required when editing a contact? Enable if this is a vital piece of information that you want to be added to all contacts. 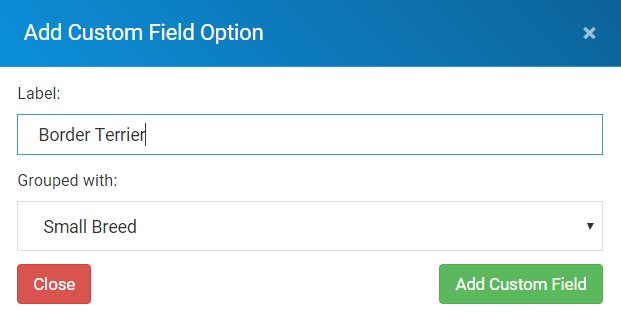 Save changes and this Custom Field will be updated. 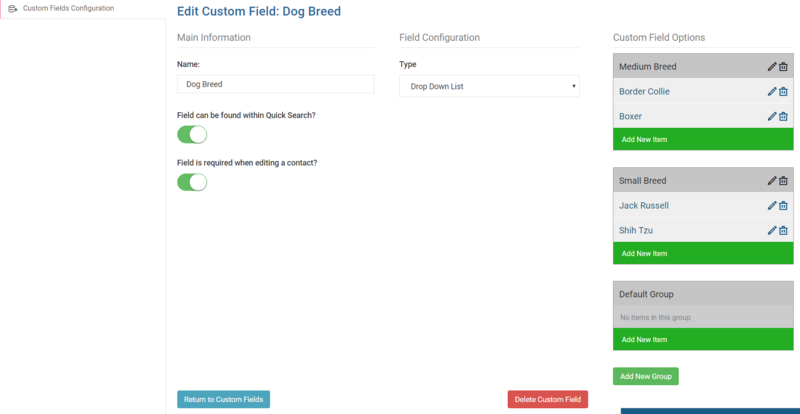 All of the other custom field types are edited in the same way except for the ‘Drop Down List’ type that we’ll cover on the next page. When adding a Custom Field of type ‘Drop Down List’ there are some other elements that required configuring. 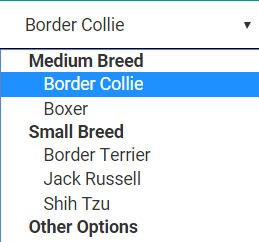 The example below shows how a custom field called ‘dog breed’ would be set up. To set up a group, select ‘Add New Group’ from the bottom of the edit screen and enter details into the following window. 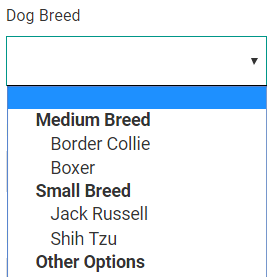 In this example we are setting up the ‘Small Breed’ group into which smaller breed types can be added. 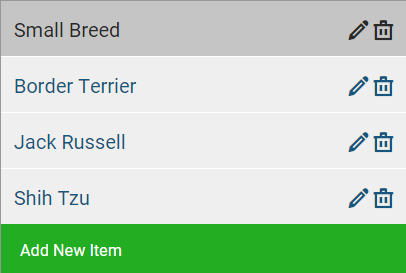 To add a new item to the new group that you have set up (in this case Small Breed) select ‘add new item’ from the bottom of the group object on the right hand side of the page. The image below shows how the data is represented on the Contact’s details in this scenario of a dog groomer. All new clients added to the system will have these details saved against their details.